Is been awhile I didn't post new things to eat in my blog here already reason only one because I put more time on my kids now. I want to spend more time with them. Looking at my two kids one day bigger one day very fast feel like want to use a remote control to pause them no grow up so fast! So today I found a new dish I never see and eat before! After send my two kids back home from school me and my wife went to Gadong Central eat breakfast at the Babu's Kitchen (Halal Certified). This is one of my favorite place to eat almost one week one time makan here coz my daughter having an extra class near this area so every time after her class we came here to eat some light foods. 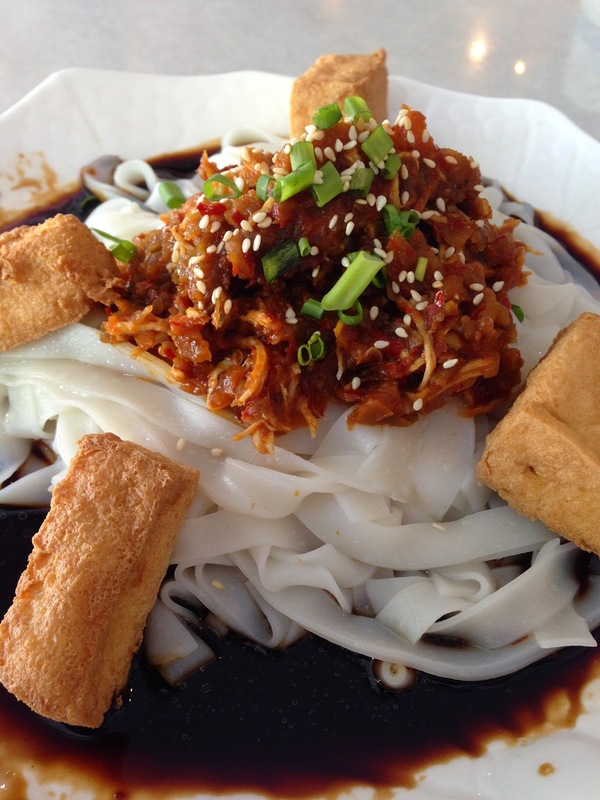 So today I notice they have a new menu and I saw something rare in the menu which is this "Cai Siang Kuey Teow" if not special or unique or yummy I'll not simply introduce you all here! This is really rare and I never heard it so I call the waitress what is this call "Cai Siang" but after they explain already I still don't get it what is that "Cai Siang" so I just say Ok order one and try. After the Cai Siang Kuey Teow come I was a little surprise... It's a little bit looks like the Jing Chew's "Sesame Kuey Teow" but have a Korea food style!! Is like a Kimchi paste with little bit chicken and sesame on top the Kuey Teow. A little soya sauce on the plate with 4 pieces of Tofu on the side! Rare right... this is really new I never eat like this way. The paste is nice with no so spicy, after I have a bite I notice there is something crunchy in the paste then I realize is from the some kind of chinese pickle. I don't know how to describe the taste but I can say is unique!!! Can give a try but don't tapao it must eat it the tofu hot hot!!! At first I also confuse how to eat this new Cai Siang Kuey Teow... So I just mixed it up the paste with tofu and kuey teow together but after that I think I do it in the wrong way.... I should separated the paste and tofu first on the side then mixed the kuey teow with the soya sauce then eat Cai Siang like sambal baru correct... coz that is the better way you can taste more yummy with the Cai Siang!!! Go try it you may like it as well!! !